A letter on the AP Statistics EDG last week reminded me that I am still missing a big detail about the notation for Derangements, or Subfactorials. The questions asked something like, how many ways can 5 letters and 5 envelopes be mis-sorted so that exactly two are in the right envelope, or maybe it asked for the probability of such an event... anyway.. The method of placing an ordered set in such a way that no element falls in the correct order is called a derangement. The number of ways of completely mis-sorting all of N objects is often represented with the notation !n and called subfactorial n.
|| n in imitation of the symbol for factorial introduced by Jarrett that was then common. Cajori's classic on the symbols of mathematics, (published in 1928) gave no mention of the use of the !n notation, but does credit G Crystal with the use of an inverted exclamation mark after the n. Perhaps the age of the typewriter ushered in the move to placing the exclamation mark at the front. A simple way to compute the value is to round the answer of n!/e. It can also be found by a recursive rule... using F(0) = 1 and for each new value F(n)= n F(n-1) + (-1)n. So F(1) = 1(1) - 1=0 (makes sense, you can't mis-sort if there is only one letter and one envelope), and F(2) = 2(0)+1=1(Put Letter A in envelope B and vice-versa) and F(3)= 3(1)-1=2 etc. The sequence was first produced by Nicolaus Bernoulli in trying to answer the following problem, which was posed by P R de Montmort (it may be that Montmort already had a solution). 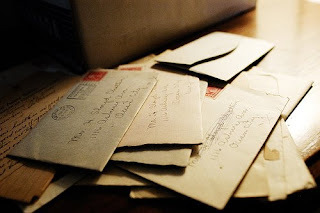 If N letters and N Envelopes to contain them are prepared, in how many ways may ALL the letters be placed in the wrong envelopes. The solution is !n, and the first few answers are 0, 1, 2, 9, 44, 265, 1854... .
Euler used the same method to develop the probability of winning in the game of rencontre, now called "coincidences" in his paper "Calcul de la Probabilite dans le jeu de Rencontre", published around 1751. An English translation of the paper by Richard J. Pulskamp is available at this site and the original document can be seen here. So I know a little, but the most common present day notation is !n, and I don't know who first did it, or when they did it... so if you have a collection of old math books that includes some probability etc... and you come across a usage of this symbol, drop me a note, or better, send me an email with a digital image.. I will make my students name that first-born mathematically inclined child after you. Math Teachers at Play # 8 is up for your entertainment and education at Let's Play math.... and they have math jokes... including the one above, which made me chuckle.. They also have a link to Soma Cubes (Soma Do, and Soma Don't)... A geometric assembly puzzle that, in the words of the creator, Piet hein, shows, "It is a beautiful humour of the nature, that the 7 simplest irregular combinations of cubes, can be recombined to the cube again. The multitudes of unity is again producing the unity. This is the worlds smallest philosophic system, and that surely must be an advantage". Like most people of my generation, I was first introduced to them by Martin Gardner in Scientific American, and was unaware until today that they were invented in 1936, "during a lecture of Quantum physics by Werner Heisenberg (Father of the un-certain principle). " Dave Marain at MathNotations has several nice SAT problems that are worth stealing for your own class room. So get over there, and enjoy yourself. 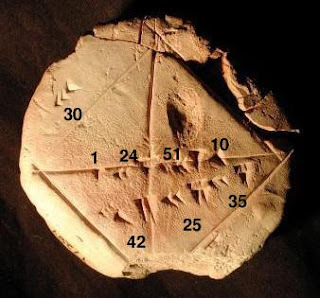 Physical evidence exists that the Babylonians had a method of calculating the square root of some numbers as early as 2000 years before the birth of Christ. In the Yale collection there exist an artifact that shows the calculation of the square root of two to five decimal places accurately. One image of the item, called YBC7289, can be seen above. What may surprise many students is that the ancient Babylonian method seems to be the same as the method frequently taught in school text books. The method is frequently attributed to Heron (or Hero) because it appears in his Metrica, and is also called Newton’s method, but most students who know the method, know it as the "divide-and-average" method. I was recently reminded of this while reading a nice post about it from Brent over at The Math Less Traveled. He did a nice job of showing why it worked...except.. It was all algebraic.. and I don't think the Babylonians had a very developed synthetic algebra at all. So I wondered how they might have convinced themselves of its authenticity by geometric methods. 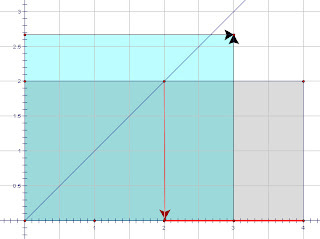 Knowing full well that if he bisected the angle in a corner of a square, he would also bisect the opposite corner, he constructs the angle bisector (y=x in my image) and observes that it does NOT hit the opposite corner... a 2x4 rectangle is NOT a square.. Now he drops a vertical line to the base of the rectangle (x-axis to we moderns) and can see the difference between his two rectangle sides... SO, let's just average the two sides and try again. We make our base equal to the average of 2 and 4 (I got 3) he sets his base equal to 3. Dividing eight by this new length, he creates another rectangle with an area of eight that has sides of 3 and 2 2/3, closer to equal than the last. Noticing that it is Still not a square, he constructs another base averaging 3 and 2 2/3 and repeats until the accuracy of the construction meets his needs. A second excursion of fantasy adopts a more modern idea that is too little known to students and teachers today. 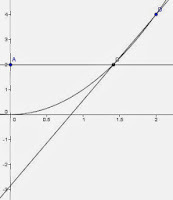 If you pick two points (a, a2) and (b, b2) on the curve y=x2), the line segment connecting them will cross the y-axis at the point (0, -ab)... This gives an easy way to find the square root of eight. I constructed a point at (0,2) and used a horizontal line (easy on graph paper) to find the point (1.414,2), then the point (2,4) falls out on grid paper quite easily. 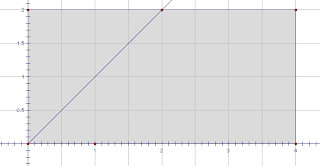 The line will now intersect the y-axis at the point x=0 and y= -sqrt(8). 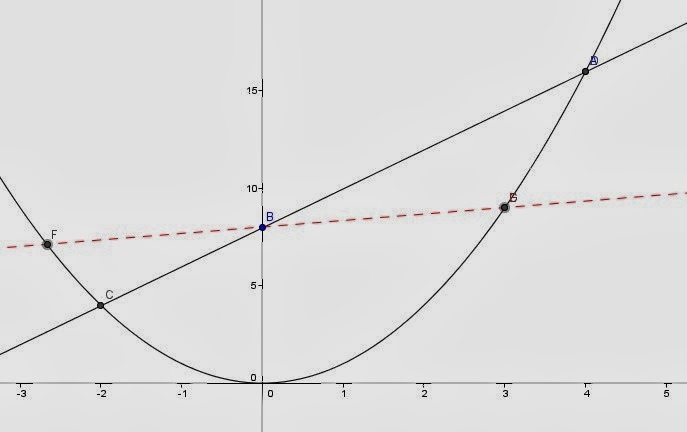 Of course a clever student might just draw a horizontal line at (0,8) and that would intersect at (sqrt(8), 8) also. I wanted to use the property to illustrate what happens when we use the divide and average method. 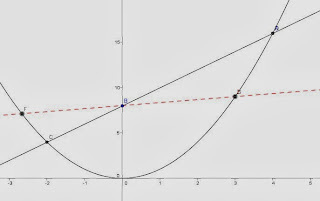 Working backwards, we can start with a point at (4, 16) and drew a line through (0,8) to the opposite side of the parabola it would intersect at (-2,4) [because -(-2)x4=8]. So two geometric approaches to the divide and average method of finding square roots. Hope they may be useful to someone. I just read a nice blog over at the NUMBER WARRIOR by Jason Dyer about using logic diagrams for graphic organizers to point out relationships between math objects. It is a nice post and I wouldn't (couldn't) improve on it, so check it out. BUT..... (isn't there always a but..) In the article, which was titled Carroll Diagrams, somewhere along the way he pointed out that,"I’ve used something like this before in geometry for sorting triangle types, but I never knew there was a name for it..." [emphasis added]. Well that set off the math historian in me.... Jason is a clever guy who knows lots of math and somehow, when we let kids that clever grow up and teach math and they haven't been introduced to (at least a mini-) history of logic diagrams, something HAS to be done.. so some notes about the history of logic diagrams, as I understand them at this moment in time. When I grew up these type of logic diagrams were always known as Venn Diagrams, after the Cambridge mathematician John Venn(1834-1923). Venn was a lecturer at Cambridge and worked mainly in logic and probability theory. He used diagrams of circles to represent the unions and intersections of subsets of a Universal set in non-overlapping regions. You can find more about his life at this page from the Electronic Journal of Combinatorics. It appears that the first person to call these types of diagrams "Venn diagrams" was Clarence Irving in his work, A Survey of Symbolic Logic in 1918. Then, in a note at the Euler Project web site, maintained by Prof. Ed Sandifer, I found a note suggesting that the diagrams are actually the creation of Euler. "Letters to a German Princess is likely to be the source of much of what people attribute to Euler. For example, I know that what we call Venn diagrams first appear in there. (Venn himself first called them "Eulerian Circles", but then managed to get them called Venn Diagrams later on.)" "WAIT!" You scream, Venn, Euler, but the title was Carroll Diagrams,... Ok, I'm getting there.... you see, Lewis Carroll, who was in his other reality the Oxford math lecturer Charles Dodgeson, also did some nice work on Logic Diagrams. He approached set diagrams with rectangles. 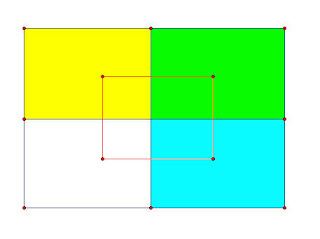 The image at the top shows an example of how Carroll's diagram might look for three sets(above the middle, right or left of middle, and inside or outside the inner rectangle). So why do I (and many others) persist in calling them Venn Diagrams.. In his book Cogwheels of the Mind, The Story of Venn Diagrams, Professor Anthony Edwards of Cambridge explains that the Venn Diagram were much broader in scope than Euler's, and in a comparing Venn's work to previous, and sometimes similar, work he states, "Venn's own contribution, which fully justifies our attaching his name to the general diagram was the first to see that the diagram could and should be generalized to any number of sets..." Professor Edwards is a Fellow of Gonville and Caius college as was Venn, and played a part in the design of the commemorative glass shown above, which is at the college. The Glass is part of a set of six that are all commemorative of math and science people. Professor Edwards is an accomplished mathematician, statistician, geneticist in his own right, as well as being the last graduate student of the great R. A. Fisher. He came up with a method of extending set diagrams to any indefinite size by drawing them on a sphere, and sterographically projecting them back onto a plane to create the cogwheels of the title of his book. See his book. Like Venn before him, Professor Edwards is a Fellow of Gonville and Caius (pronouced "keys" for us Americans), at Cambridge. He is not only very brilliant, but a nice guy to boot. He showed my wife and me around the Great Hall at G&C and let me see the inside view of the stained glass tribute to Venn in the hall there. He also gave me directions to Venn's grave site at the Trumpington Parish Extension cemetery. His grave was so covered with vines that I would have never found it except my very psychic wife stops by a clump of brambles and says, "I think this is it.." Sure enough, after clearing away the vines, we managed to expose the grave site, which includes Venn, his wife, his son, and his daughter-in-law. For more information about Venn Diagrams check this Survey of Venn Diagrams from the Dept of Computer Science at the University of Victoria. I took some of my math students down to the graveside a few years ago thinking it would be nice to plant some flowers so they would always remember they honored a mathematician. We planted three colors of Tulips near his grave so that they would come up in a set of Venn Rings... and the grave that hadn't been mowed for years before I tore back the brambles to expose it, was mowed the next spring.. so I saw three tiny circles of green shoots cut very close to the ground.. oh well, it was a nice drive out in the spring. SO that's what I know, and if you want to add more, send me a comment, I would love to add your information. I was sitting with a small group of math teachers at a meeting and I asked about their methods of "Testing for Understanding." It seems that for many (most?) the answer was a combination of "They can do the homework." or "They can pass the tests." Am I just looking for too much? Anyway, while doing some serious research (playing around on google search) I came across a page called Understanding Mathematics, a study guide by Peter Alfeld. Explain mathematical concepts and facts in terms of simpler concepts and facts. Easily make logical connections between different facts and concepts. Recognize the connection when you encounter something new (inside or outside of mathematics) that's close to the mathematics you understand. By contrast, understanding mathematics does not mean to memorize Recipes, Formulas, Definitions, or Theorems. " He then goes on to give a few examples (powers, logarithms, quadratics) which he uses to amplify his explanation. I think the student who can explain why 8-4/3 = 1/16 without too much armwaving probably has a pretty deep understanding of the exponentiation process. I'm not as sure about his quadratic solutions model. He talks about the quadratic formula and then states, "Forget about the formula, it's an example of clutter. (To this day I cannot remember it.) But since you understand these matters you know how the formula was derived." I'm not sure I believe him. Ok, I know that sounds kind of harsh, but if you derive the quadratic formula a few times it sort of sits there looking at you all the way through, doesn't it... I see it and know what it is I'm working toward. I agree that one ought to be able to derive the quadratic formula by completing the square, or at least solve quadratics without the formula, but then I remember a quote I have from Euler in my notes on "Twenty Ways to Solve a Quadratic Equation": Even a great mathematician like Euler, after deriving the formula, suggests “it will be proper to commit it to memory”. from An Introduction to the Elements of Algebra . Euler understood math, and when crunch time comes, you gotta' really sell me to make me disagree with him. I don't have a wide range of clear delineators of understanding, but a kid who looks at a quadratic with a positive leading coefficient and a negative constant term and can't tell me how many real solutions it has does NOT understand solving quadratics, no matter what he has memorized. And if I write some ugly equation on the board the kid has never seen before and ask, "What happens to the graph of this if I replace all the x's with x-2 and he says it moves to the right (or left, I'm easy) I think they understand something big. If I tell him that (2,3) and (3,5) are on the graph of f(x) and ask him what f-1(3) is and they have no clue, I think they have missed something big. 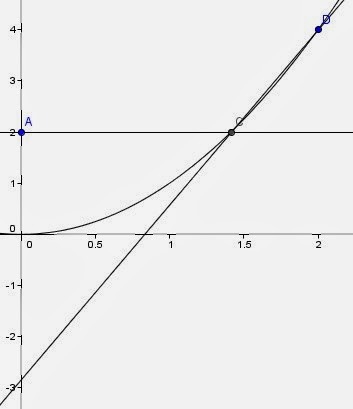 Here is a recent example, we were talking about H1N1 and working with the logistic curve and I was explaining that the maximum rate of growth occurred at half the maximum value, such as here. I suggested that from this point they should be able to see that the ab-t = 1 and that would lead them to see that bt=a. But for many (most) of them sorting out that the exponential part = 1 was too many steps at once... in fact for a large number, it just did not make sense that 1+ab-t=100/50 (seeing past the clutter?). Whether you think of this as a division property or the means and extremes property of proportions, it seems to me that if you don't see this "clumping" (I think that was Polya's term) you can't be very flexible in math patterns. Ok, so send me your gut tests... If they can do THIS, they mostly "get it", or, conversely, if they can't do THIS, then they definitely don't "get it". A while back I snitched part of a post to the AP Calculus EDG from John F Mahoney. He wrote, "Friends - Here are some topics I've used in pre-cal and calculus for 'debates' with students..." and then he lists five items, all of which are good, some of which are potentially great because you can talk about them over and over. I wanted to amplify his remarks a little, so here is his list intersparsed with my comments, questions, concerns, and .... well, other stuff. Anyway, pick your favorite topic, and tell me what you think with a comment. 1) Should rectangles be considered to be trapezoids? Argument for: The trapezoid rule is based on trapezoids. If the function has a piece that is constant, wouldn't the trapezoids under that piece be rectangles?" I wrote recently about the choice of inclusive and exclusive defintions in geometry, and particularly whether a trapezoid should be defined as "at least one pair of parallel side" vrs. "exactly one pair of parallel sides." I tried to engage another teacher who answered the discussion by looking in the glossary of his book... exclusive definition, end of discussion... teaching is like that for some folks. So are squares a subset of rectangles which are a subset of parallelograms which are a subset of trapezoids, which are... (ok, I'll stop now)..what is your answer, and why? Remember when you answer.. you are talking to High school Calculus and pre-calculus students. 3) Consider a circle of radius r. Draw a chord at random, what is the probability that its length is > r? 4) What if you could take logs of negative numbers? How should they be defined? This one is good for discussion because the technology is such that some of them have played around with their computer/calculator/W_alpha and actually have an inkling. 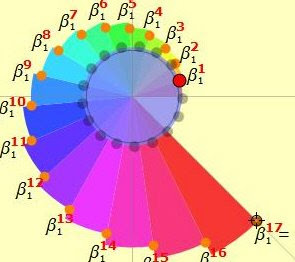 5) Circular functions are based on the unit circle. How should we define similar functions based on the unit square - or the unit diamond? I have never tried this one, but it seems like a great project: lots of things to consider.. like what is the "unit"?, and what is the period... and what about a "unit triangle"? 6) A cube is usually what people say when you ask them what is the thing like a square but in three-space... I still ask, but they usually give that answer, or can't explain much about why they gave the one they did. But then ask them what is the three-space equivalent of a triangle. I usually ask this with the instructions to write down the name, or draw it if you can't name it... that gives everyone that long thinking time to pick their own uninfluenced by a snap answer from a classmate. I get several different responses. Of course the follow-up is why do you think that is the best one. You can send me your choice and a justification if you would. What would you add to the list above? What is your favorite discussion opener to make kids think? Share, Please. The hard part in evaluating students is to figure out when they really "get it." When they actually understand. The kid who makes the mistake in the picture above, almost understands canceling in simplification. The hard part is to find out just what it means to understand. If they can explain what happened, I think they understand. 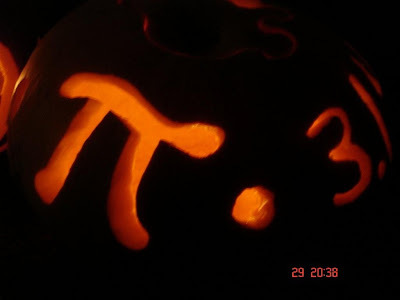 Credit for creative kids, the picture above is the Halloween pumpkin carved by Sonja, one of my HS kids last year. The question about this one for the really clever student is what does it have to do with the old calculus limit of Sin(theta)/theta... or the half angle formulas? But today I came across one I had never seen, from the master of us all, Euler. Euler, it seems wrote pi/2 as an infinite product of fractions in which the numerators were all prime and the denominators were all even numbers excluding multiples of four. What appears from what I see is that each denominator is one more or less than the prime in the numerator, but always avoiding the one which would be a multiple of four... (Ok, now how do you write that as in product notation??). I looked for this a little and could not come up with a reference. 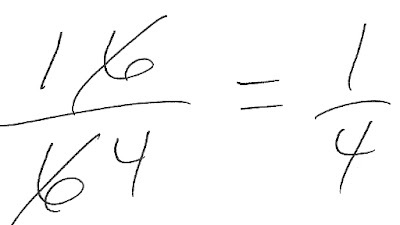 If anyone knows where Euler wrote this, please advise. ln2 = 1/2 x 3/2 x 5/6 x 7/6 x 9/10 x 11/10 ..."
Vlorbik picked up on my "factoid interlude" in my last blog that no one called Fibonacci by that name in his lifetime. When he asked, "Who did? ", I realized that thousands of students (and their teachers) probably do not know that name was added well after his death. So here is the story, as well as I know it, from the notes on my Math Words Etymology page. According to Paul J. Nahin, author of AN IMAGINARY TALE, the name Fibonacci was not common until centuries after Leonardo's death, and during his lifetime he was called Bigollo, a slang term for a loafer, and my wife's favorite term for me, drawn from the word bighellone. Julio Gonzalez Cabillon has written, "The name 'Fibonacci' most probably originated with the historian of mathematics Guillaume Libri (1803-1869)." I quoted in my posting of August 28. The paper starts with the diskussion of what is known of persons of the Bonacci family other than Leonardo: One Matteo Bonacci is known because he is mentioned as a witness of the treaty Pisa and Genova signed on February 13, 1188. Then he lists the names of authors who use the name "Leonardo Pisano". Then he lists the names of authors who use the name "Fibonacci". August de Morgan 1847. He also uses Bonacci. Then he lists the names of authors who explain "Fibinacci = filio Bonacci"
Then his arguments for Fibonacci = de filiis Bonacci follow. Then he discusses the sobriquet Bigollone, Bigollo, Bigoloso. Finally, in the major part of the paper, he discusses the various manuscripts of the various works of Fibonacci still in existence. The question "who gets the credit?" is still open. By the way, a personal footnote, On the last day of my first visit to Pisa I missed a turn and came upon the Via Fibonacci quite by accident. And just a followup, we DO know who first invented the term "Fibonacci Sequence". It was created by Edouard Anatole Lucas, who is also known for inventing the "Towers of Hanoi" puzzle. I love buffets... sometimes when I look at the menu in a regular restaurant and everything looks so good I hate the thought I have to pick just one. 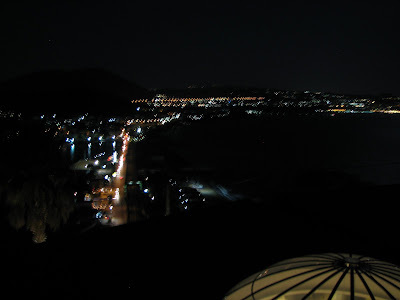 I will forever remember a wonderful dinner with my beautiful wife on our first night in Naples.. a room with a view of the moon over the bay and then a great dinner, and for dessert, three incredible choices.. we simply could not decide. Then the waiter leaned over and quietly asked, "Would you like me to order a selection with some of each?" WOULD WE! and then it came, each dessert tempting the mouth and mind to ignore all the others.... THIS was the dessert you lived to taste, and yet, each was made even better by the presence of the other two..... ahhh, it is the dessert of our life. That's why I like Math Teachers at Play. It is like a buffet of mathematical and educational ideas, and this one has way more than three delicious treats for teachers at every level. This time Denise has a lesson about quilts, Jason Dyer has a picture of a curious and interesting French plate (which also came from Denise I think down the line, clever lady)... look at the picture before you read the blog and see if you can figure out what it was for... It reminded me of the old pancake flipping problem, but that is only to distract you because it has almost nothing to do with pancakes. Maria's Homeschool blog was about teaching division to student's with dyslexia. I worry about the number of parents who choose to homeschool their challenged students, not because I think they won't do a good job, but because it makes me realize they don't think WE do a good job, and I fear they may be right. I still struggle with the kids who "just don't get it" after I have explained it every different way I can think of... so I'm still looking for insight to teaching better at my somewhat extended age. Speaking of "not getting it', Vlorbik (always a good read) talks about why the bright kids in calc can't see simple ideas about the derivative of a constant ...(but sir, it didn't LOOK like a constant)... and speaking of constants, if you think you know about phi and Fibonacci (factoid interlude, NO ONE called him that while he was alive) but you can't imagine how they relate to Geometric Sequences (pause while you scratch your head and contemplate).. then see John Cooks article (another regular big-hitter on my list). Ok, one last word thing since it has shown up here so much....did you know the word dessert is derived from the French term for "clear the table".... I swear, I would not make this stuff up. Before there was Sudoku, before there was Rubik's Cube, there was the fifteen puzzle. In 1880 it was THE hot game to play, and seemingly everyone did, "About the year 1880, everyone in Europe and America was engaged in the solution... ". The image above shows an old copy that was for sale somewhere (sorry, I should have made a note). The object of the game was to slide the fifteen squares into the open space and by doing so put them in correct order. There are 15! or 1,307,674,368,000 ways to put the fifteen squares into the box, and exactly half of them are impossible to solve. Last night as I was thumbing through my 1917 copy of H. E. Licks, "Recreations in Mathematics", and while glancing through the section on the fifteen puzzle came across the following: "It has been stated that this interesting puzzle was invented in 1878 by a deaf and dumb man as a solitaire game. " Ok, maybe, but it just seemed too improbable.... Occam's Razor and all that... besides, I thought I had heard that it was a Sam Loyd puzzle. A litte quick research and I found a reveiw of The 15 Puzzle: How It Drove the World Crazy by Jerry Slocum and Dic Sonneveld at MAA online. If you are interested in the actual book, you can order here; and support my beautiful wife's charitable foundation. Sam Loyd was almost certainly the premier puzzle master of the late Nineteenth Century, and he was not shy about claiming credit for almost anything, and did claim the invention of the Fifteen Puzzle in his books. The more likely truth, is that , "The puzzle was "invented" by Noyes Palmer Chapman, a postmaster in Canastota, New York, who is said to have shown friends, as early as 1874, a precursor puzzle consisting of 16 numbered blocks that were to be put together in rows of four, each summing to 34. Copies of the improved Fifteen Puzzle made their way to Syracuse, New York by way of Noyes' son, Frank, and from there, via sundry connections, to Watch Hill, RI, and finally to Hartford (Connecticut), where students in the American School for the Deaf started manufacturing the puzzle ((So there was the connection to deaf and dumb inventor story) and, by December 1879, selling them both locally and in Boston (Massachusetts). 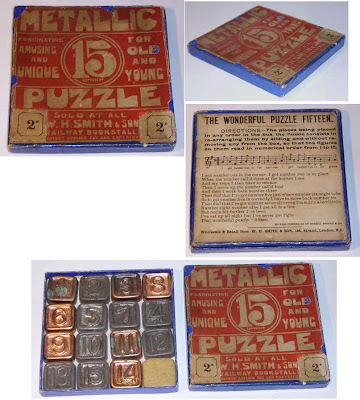 Shown one of these, Matthias Rice, who ran a fancy woodworking business in Boston, started manufacturing the puzzle sometime in December 1879 and convinced a "Yankee Notions" fancy goods dealer to sell them under the name of "Gem Puzzle". In late-January 1880, Dr. Charles Pevey, a dentist in Worcester, Massachusetts, garnered some attention by offering a cash reward for a solution to the Fifteen Puzzle. The game became a craze in the U.S. in February 1880, Canada in March, Europe in April, but that craze had pretty much dissipated by July. Apparently the puzzle was not introduced to Japan until 1889. Noyes Chapman had applied for a patent on his "Block Solitaire Puzzle" on February 21, 1880. However, that patent was rejected, likely because it was not sufficiently different from the August 20, 1878 "Puzzle-Blocks" patent (US 207124) granted to Ernest U. Kinsey. "(from Wikipedia)... ( Kinsey's patent has an application date in November of 1877, and includes interlocking pieces so they stayed in the box like modern fifteen puzzles do An image from the patent is here. What Sam Loyd did do, was realize that in 1/2 of the 15! possible ways to put the 15 squares in the puzzle, it could not be solved. He immediatly offered a $1000 prize to anyone who could solve it in his newspaper aritcle, magazines, and books, and draw a ton of free advertising. I put a copy of the puzzle on my side bar for those who wish to give it a try, or if you want, you can play a version that has 8 numbers (3x3 board) 15, or 24 numbers (5x5 board) . One of the things that was discovered about the Loyd Puzzle, the one that could NOT be done, was that if you left the blank in the top left hand corner (putting 1-2-3 in the top row, then 4-5-6-7 next, etc), it would be possible to put all the numbers in the correct order. This would be the same on the solvable puzzle as getting all the numbers in the right order except reversing the 14 and 15... try it. Show that the numbers from 1 to 15 can’t be divided into a group A of 13 numbers and a group B of 2 numbers so that the sum of the numbers in A equals the product of the numbers in B.
JD2718 commented on my last post and seemed surprised at my interest in the origin and development of mathematical language and terminology. He reminded me of one of the interesting stories that kindled my interest in the history of math language and symbols. I first got interested in a very superficial way when my kids would ask those same questions year after year; "Why do we have "right" angles and not "left" angles?" "Who in the heck invented a word like Rhombus (and what does it have to do with Rodeo Clowns)?" Over the years I developed an interest in the etymology of language in general, but my main focus has always been math words and symbols. One of the surprising things I learned is that sometimes, the usage of a word completely reverses meaning over time. Words like "nice" for example, which once meant ignorant or stupid (it is actually a contraction of nescient, without knowledge, which is still in many dictionaries) "Silly" on the other hand, was a compliment (compliment is another interesting word, ( related to the math word complement). Silly was used much as we might call some one "bubbly" or effervescent today. Often the usage by one influential person could determine the usage, or altered usage, of a term; note Shakespeare's influence on the meaning of weird. Just such a thing happened with the terms "trapezoid", and "trapezium". "TRAPEZIUM and TRAPEZOID. The early editions of Euclid 1482-1516 have the Arabic helmariphe; trapezium is in the Basle edition of 1546. Both trapezium and trapezoid were used by Proclus (c. 410-485). From the time of Proclus until the end of the 18th century, a trapezium was a quadrilateral with two sides parallel and a trapezoid was a quadrilateral with no sides parallel. However, in 1795 a Mathematical and Philosophical Dictionary by Charles Hutton (1737-1823) appeared with the definitions of the two terms reversed: Trapezium...a plane figure contained under four right lines, of which both the opposite pairs are not parallel. When this figure has two of its sides parallel to each other, it is sometimes called a trapezoid. No previous use of the words with Hutton's definitions is known. Nevertheless, the newer meanings of the two words now prevail in U. S. but not necessarily in Great Britain (OED2). I also have an English textbook that uses trapezion (note the n ending) for the shape we more commonly call a kite. In A Junior Geometry by Noel S. Lydon published in 1903 the definition on page 55 states A trapezion is a four-sided figure having two pairs of adjacent equal sides. It goes on to show the method of construction. Some geometry textbooks define a trapezoid as a quadrilateral with at least one pair of parallel sides, so that a parallelogram is a type of trapezoid. Euclid did not define the shape we now call a trapezoid, and the "trapezia" is defined by default.... "let quadrilaterals other than these be called trapezia" [from the Heath translation]. Heath's translation states that the language used implies that Euclid may have been creating a new word, or using an existing one in a new way. Proclus seperated out trapeziums and trapezoids (backwards to what we now do as explained in the quote above from Jeff Miller's page) but it seems clear he meant that a trapezium had exactly one pair of sides parallel (an exclusive definition) rather than at least one pair of sides parallel(an inclusive defintion). Many mathematicians today prefer the inclusive definition so that a parallelogram is a special case of trapezoid. Apparently this has been a question in geometry for a while as I recently read a note from Neal Silverman which suggests that the inclusive definition has appeared in some books back at least to 1900.
" I recently acquired a copy of "New Plane & Solid Geometry" by Wooster Woodruff Beman and David Eugene Smith (Ginn 1900), a revision of their earlier 1895 work. ... But as to quadrilaterals, consider their definition of trapezoid: "A quadrilateral that has one pair of opposite sides parallel is called a trapezoid." They go on to state that "[b]y the definition of trapezoid here given it will be seen that the parallelogram may be considered a special form of the trapezoid. (section 97 at p. 59). It seems that the inclusive definition was not well received as in the same post Neal adds, "D. E. Smith went on to write many more books on geometry, some of which were revisions of the old Wentworth books. I have never seen this statement in any of his later books." The etymology of "trapezoid" is quite interesting. It's a corruption of "tetra-pes-oid", whose three parts mean "four-leg-shaped", or perhaps more familiarly "table-shaped", since "tetra-pes" was a familiar Greek name for a small table. A few blogs ago, vlorbik sent a comment that included the suggestion that "mother function" might have been one of the victims of social censure and thus gave rise to the emergence of the (apparently) more socially acceptable "parent function." From what I have been able to discover in a short period of researchs, the use of terms like "parent function" seems to have worked its way into mathematics from statistics, which seems to have gotten it from the anthropologists/sociologists. "if it should bear the same relation to the parent population that.."
Prior to 1900 there are almost no listings of "parent function" in a mathematical usage. Around the end of the 19th century, statisticians began to talk about the distribution from which a sample was taken as the "parent distribution" of the sampling distribution (population of all samples of some size n). Some of these may be related to the study of eugenics in which the study was about the relations of some characteristic of the offspring to the actual parents, but the usage grew. Occasionally I find the term "parent function" applied in this way when the distribution of the original sample was a normal distribution. by American Statistical Association, Institute of Mathematical Statistics, JSTOR (Organization) - 1948" Usually the parent function is the Type A or normal curve, as discussed by Gram "
There are also some early uses of the "parent function" in association with the use of inverses and derivatives in calculus and analysis texts back to about 1925. By 1970 the term had become commonly understood, but not abundantly used. ".. of an inverse function and its relation to the parent function or else in failure to attach clear meanings to the terminology and notation employed. ..."
It was the 1980's and the introduction of computers and graphing calculators into modern classrooms that seemed to make the term "parent function" ubiquitous. Any function that appeared on the calculator was a parent function, and the translations, rotations, shears, etc became the "children". I think this use also led to the introduction of "mother function" rather than the other way around. I can only find a few examples of "mother function" and there does not seem to be any pattern to the frequency as one might expect if a term had arisen to replace this one as an "off-color" predecessor. In fact, it seems "mother function" is more commonly used by continental writers, often in conjuction with "daughter functions"; but admittedly the sample size I have to draw on was small. If you are one of those people with access to old journals, or a collection of old texts, I would appreciate any references to the use of any of these terms and a source earlier than 1900; and if you have a way to make a digital copy and send it by email, I will have my students name their children after you. "What do you call a person who can't tell a coffee cup from a doughnut?" "A team of three has solved a 45-year-old problem in the mathematics of topology. The Kervaire invariant problem is 'one of the major outstanding problems in algebraic and geometric topology' says fellow mathematician Nick Kuhn, at the University of Virginia in Charlottesville." Ok, I admit, I never heard of the Kervaire problem, but that doesn't mean I am topologically stupid, and so when they showed the picture at the top, my mind jerked.. ???? Sure enough, later in the article, they had the comparison I expected, right before a rather complicated description of the details of the Kervair invariant. It said, "Algebraic topology is a way of describing the properties that objects with the same topology have in common. 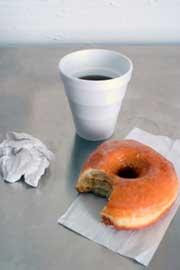 Topologically equivalent objects are objects that can be converted into each other by deforming but not tearing them: a sphere and an eggshell, for example, or a doughnut and a coffee cup." (my emphasis). But of course they mean a coffee cup with a handle, like this one, so that both shapes are really a form of torus (doughnut) like objects. Spheres punctured with a single hole. Ok, I know they probably told some intern to get a file picture of a doughnut and a cup of coffee, and he did, but from top science mags... you just expect a little more. Which brings me to my final question for someone who really knows topology.... is a Mobius Strip also a Genus one object like a torus? I got a nice note from Vlorbik on my last post about the influence of political correctness (not his term) and its influence on math in the past. I don't know if that is a first name or a last name, and I actually tried a little to find out, but I do know he has an unusual collection of blogs, including one on Community College Calculus which is always a good read. Vlorbik wrote, in part, "i've heard, though never verified, that victorian prudery also caused certain teachers to begin referring to the "arms" rather than the "legs" of a right triangle.."
I have a pretty extensive collection of old textbooks, including many British texts, and I don't remember ever seeing anyone use "arms" in that fashion, so my first thought was that, if it were true, it was only a very minor usage. Since the good lady ruled from 1819 to 1901, I thought I would search before and after her reign. I pulled out my 1804 edition of Playfair's "Elements of Geometry", published in Edinburgh. He referred to the right triangles sides as..."sides"... His Book VI, prop. XXXI reads exactly like the Thomas Heath Translation. No help there, so I skipped forward 99 years to the other end of the Victorian period, 1903 and looked in "A Junior Geometry" by Noel S Lyndon, published in London, only to find he also used only the terms hypotenuse and "other two sides" in his statement of the Pythagorean Thm. Perhaps neither term was common in the Victorian peridod, and these stories were a bit of urban legend. I went on to Google Books to see if I could find any examples of geometric usage such as Vlorbik had described..... I entered a search for "arms 'right triangle' geometry"
....Yikes", there they were. The first listing was "Plane Geometry" by Arthur Schultze, Frank Louis Sevenoak, Limond C. Stone, from 1901. It contained, "The sum of the squares of the arms of a right triangle is equal to ..." along with 388 other listings, some dated as late as 2008. "In a right triangle whose arms have lengths a and 6, find the length of the .." appears on page 451 of the fourth edition of Schaum's Outline of Geometry from that year. Ok, but that still did not mean it was the influence of the dreaded Victorian stuffed-shirts... I switched the cut-off to 1850... and there were NO results prior to that year... only one last check. Would there be examples with the use of "legs" prior to that year? There were indeed, including several by the famous American Mathematician, Benjamin Pierce. Another from 1734 was from the British Benjamin Martin. So it appears that there was some pressure to use "arms of a right triangle" suggested by these dates; but there is still no smoking gun. Does anyone out there know of a document or statement of any kind in the math education literature that makes a clear suggestion to teachers? If you know of such a document, please share whatever level of information you have and I will pursue it. And thanks again to Vlorbik for sharing this tidbit of math language history. I also followed up a second part of his comment, and learned a little more about the evolution of "parent functions".... but that will have to be another day.